Asia's river dolphins are in danger of extinction because of the damming of rivers and declining water quality, says global conservation body the WWF. Once-thriving populations are being threatened by human activity. Only a handful of individuals of a local species of dolphins are now left in China's Yangtze River. The WWF's warning comes as part of the build-up to the United Nations International Decade of Water for Life, which is to be launched on Tuesday. Fresh water dolphins are key indicators of the health of rivers, according to the WWF; not only because of the direct effects of low water quality on them, but because they prey on fish which are themselves sensitive to the state of their environment. Distinct species of dolphin inhabit the Yangtze, the Ganges, the Indus and the rivers of South East Asia. Only 13 individuals now survive in the Yangtze River. Elsewhere, they are numbered in just thousands. Industrial and agricultural pollution is one problem. 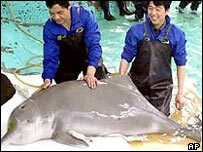 Residues of pesticides and herbicides have been found in dolphin tissues. Human sewage is another. So is the damming of rivers - restricting their natural ranges, and destroying the spawning grounds for the species of fish they prey on. Abstraction of water from the rivers exacerbates the problems - only 5% of the water in the Ganges reaches the sea. But the WWF is not simply concerned with the survival of some of nature's more elegant species. The plight of the dolphins, the WWF says, should alert us to the risk to humans of low-quality water. And solutions that help dolphins can also help the hundreds of millions who live along the banks of Asia's great rivers, the group says.